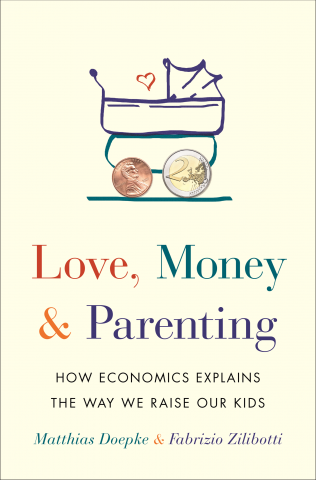 Find out more about my new book with Fabrizio Zilibotti on the economics of parenting: Love, Money, and Parenting: How Economics Explains the Way We Raise Our Kids. Published by Princeton University Press. Buy the book on Amazon. Take the Quiz: What is Your Parenting Style? The paper Bargaining over Babies: Theory, Evidence, and Policy Implications (with Fabian Kindermann) has been accepted for publication in the American Economic Review. I am visiting CREI during the 2018/2019 academic year. Link to my Google Scholar Profile. Schedule and Presentation Rules for Macro Lunch Seminar. I am an editor and former coordinating editor of the Review of Economic Dynamics. Call for Papers, Program, and Photo for a conference on "Families in Macroeconomics," held in Mannheim, Germany October 18-20, 2018. Call for Papers and Program for a conference on "Families and the Macroeconomy," held in Edesheim, Germany on June 22 and 23, 2015. Photos are here and here. Conference Web Site for Nemmers Prize Conference in honor of Daron Acemoglu, held in Evanston on May 16 and 17, 2013. Call for Papers and Conference Web Site for conference on "Cultural Change and Economic Growth in the Long Run," held at the University of Munich on July 1 and 2, 2011. Call for Papers and Conference Web Site for the European Workshop in Macroeconomics 2010, held at the University of Munich on June 25 and 26, 2010. Conference Program for the conference on "Asset Markets, Nominal Contracts, and Monetary Policy," held at the University of Munich on June 24-26, 2009. Some pictures with coauthors and former students.